You don’t need to know who my friend Joel is. You only need to know that I beat him to the gym today. And it doesn’t matter that he “let me win”, he says, it only matters that my victory is sweet. So sweet, in fact, that I will be enjoying a victory beverage with Joel this evening to celebrate this great accomplishment. 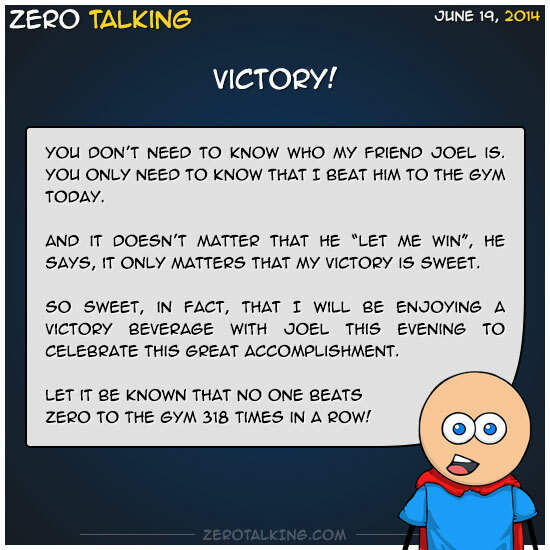 Let it be known that no one beats Zero to the gym 318 times in a row!